Luke Air Force Base will begin Phase II of Green Dot’s strategy to prevent interpersonal violence starting this month. The Green Dot initiative to prevent violence includes three phases of training. Phase I is leadership training, Phase II is bystander training and Phase III is overview training. Luke has more than 50 percent of its leadership trained and is on schedule to begin Phase II training. Nine Airmen from Luke, including Brewton, started the process in January when they attended the Green Dot prep session. While the Air Force currently uses Sexual Assault Prevention Response to help victims, Green Dot’s program is designed for prevention with a scope beyond the SAPR program. The program will start with prevention strategies for stalking, sexual assault, domestic violence and later evolve to cover additional types of violence including child abuse, suicide prevention, bullying and alcohol-related incidences. Green Dot’s strategy is proactive, not reactive. 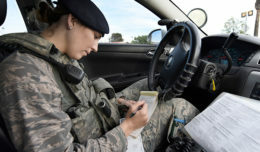 The program focuses on behaviors of Airmen in high-risk situations and what they can do to prevent a situation from escalating. Green Dot’s strategy of violence prevention is unlike anything the Air Force has done before.